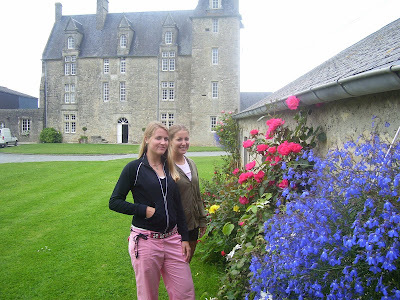 Emma Hustad and Rachel Snelen visiting a french castle B&B on their way back to Paris from touring Normandy. God has opened doors of opportunity in France for the International Christian Tennis Association. Answered prayers have brought a plan and a purpose for our tennis ministry. And through the dedication of a few people willing to walk in faith, a new ministry is growing towards not only the French Open, but to people in Paris, France. Rachel Snelen, Emma Hustad, and I, Scott Paschal, are in awe of the opportunity God has placed before us as Christian tennis missionaries and tireless workers for the Kingdom. Rachel Snelen, such a special person who has dedicated her life, not to playing tennis professionally though she reached her lifelong dream of being WTA ranked, but to reaching and discipling WTA tennis players and top juniors for Christ. And Emma Hustad, awesome… an intern with me who is dedicating her summer to helping me grow tennis ministry worldwide, and an amazingly bright, kind person full of hope and faith. She has brought a strong maturity to strengthen those around her and has reminded me of the standards I need to keep and why when choosing students and interns. 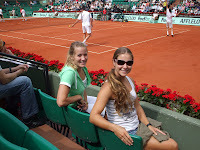 These few pics are from the beginning of our journey to Paris an d Roland Garros. I hope you enjoy them. They show our trip to Orlando Int’l Airport to JFK to Paris… and at the end of the gallery you will see a glimpse of what was yet to come. I, Scott Paschal, have a sense of excitement as we, Rachel Snelen and Emma Hustad, prepare to journey to Europe. I generally like traveling and meeting new people and seeing new things, but for me this trip has bit of extra mystery and sense of anticipation. I feel this trip will be special…. Why are we going to France? We’re traveling specifically to lay the foundation for a potential large-scale International Christian Tennis Association, ICTA, Mission Trip to the 2008 French Open, and to possibly establish an ICTA homebase in Europe. On the way to Paris and back to Florida, we’ll have some fun visiting other locations. Two places I want to check out are Rome and Athens. We’ll shoot some video footage for upcoming shows and take lots of pics. 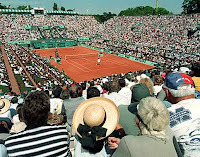 While in France, we’ll hang out at Rolland Garros and travel with our host church family. Please keep our trip in your prayers as we seek to expand ICTA tennis ministry to Europe by establishing an International Christian Tennis Association home base and laying the foundation for a potential future 2008 or 2009 large-scale mission trip in cooperation with our ministry partners and churches in France supportive of our purpose. ICTA Missions is about to get into full swing. The International Christian Tennis Association has three main types of mission trips. 1. Large scale, short term mission trips to world famous professional tennis tournaments where ICTA leases a vendor booth for the entire duration of the event and reaches tens of thousands, and sometimes hundreds of thousands, of people. 2. ICTA Pro Tennis Team mission trips to ITF pro tournament where ICTA missionaries compete in the events while building relationships with the players, coaches, umpires, volunteers, and tournament staff. 3. ICTA Junior Tennis Team mission trips where ICTA junior academy students learn to share their faith by passing out tracks at their tournaments. 1. ICTA will seek to attend 12 WTA or ATP tournaments; including a Grand Slam, several International Series, and two to three Masters-Series. In total, the International Christian Tennis Association will seek to reach well over 400,000 attendees, give out thousands of Bibles, Christian books, tracks, DVDs & CDs, ICTA Tshirts, and other ICTA product… and gain thousands of new ICTA members from countries worldwide. We will also plan to travel to Wimbledon or Paris on an exploratory mission trips designed to lay a foundation for a yearly tennis tour and prepare the groundwork for a yearly ICTA Mission Trip, Tennis Camp, and ICTA Tennis Show. 2. ICTA Pro Tennis Teams will seek to attend and compete in 25 ITF & WTA Pro Tournaments worldwide while sharing the Gospel with those they meet, speaking in churches, and building lasting relationships with players on tour. 3. ICTA Junior Tennis Teams will compete in tournaments throughout Florida while learning to share their faith to those they meet. Don’t you just love Jesus!? Isn’t it great having a reason to live! I really can’t imagine what life would be like without the hope I have through my faith in Christ. That thought drives me to share my faith with others as much as I can. Before I sign off, I’d like to ask you to keep our own Rachel Snelen in your prayers as she leads a mission trips to Canada this weekend to a $50,000 ITF tournament. And please keep her twin Melody Snelen in your prayers as she leads a mission trip to a junior tennis tournament in Florida this weekend. Melody Snelen will also lead a mission trip to a Wild Card tournament for an ITF $25,000 tournament beginning the following Monday… and a 3rd Mission Trips to a $25,000 in Florida the following weekend. Thank you for your prayers, emails, phone calls, and ecards of support. I can’t say enough how appreciated each of our friends are to us. PS. The cute gal with me is our academy dog, Bearby! 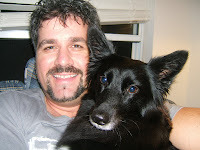 She’s been sitting in my lap each morning for nearly 4 years, since she was a puppy, as I study and/or write. Bearby often goes on mission trips with us. Meet Andre, Abed, and Vlad! Ultimate Impact Tennis Academy Pro Player Update! 3rd Annual: Ultimate Impact Tennis Academy Leadership Training Trip to Washington DC! Christian Pro Tennis Player News! Scott Paschal Tennis: Coaching 2 Ladies League Teams in Florida! Welcome Christian Tennis Player, Vivian, From Ecuador! Come See Our Fun NEW ICTA blog at TUMBLR!! Pics, Videos, Articles..! ICTA Pro Tennis Team: Dream to Reality Impacting Globally! 2010 International Christian Tennis Association Summer Updates..and more!